Lucy finds out more about her family. Wyatt comes to realization. Rufus makes a confession. Jiya takes a trip. Allegiances are proven and trust is broken. Senator Joseph McCarthy demonstrates his love for conspiracies. This is the last episode of the season (and possibly the series if the show doesn't get renewed). I thought Lucy's plan was great and organically followed from the story, which is rarely the case in these sorts of high concept shows on network television. So I was very happy with where we were going through about 95% of the episode. Even on board for the trippy visions of the future. But I'm unsure about the very end which was more what you'd expect from network TV. Please please don't hit the reset button. Lucy and the Scooby Gang notched a big win here, let them have it. Was the vision a vision of the future or was Jiya shifting between alternate timelines due to "temporal illness"? I do hope that there is a bit more to the backstory of Rittenhouse than "the gang that wants to control the world", they are certainly the villain but answering the question of how Lucy is born into "royalty" but not indoctrinated at a young age would seem to be key. You're right, it could be some kind of timeline shifting rather than a vision of the future. I thought they did a good job with this. The Rittenhousers don't tell their kids because (1) it would be dangerous to have immature people running around who might not be trusted with the secrets they command, and (2) they avoid the disease of royalties of the young not understanding what it's like not to be royalty. True there is a traumatic reveal when the kids are let in on the secret, but it's accompanied by a gigantic carrot of power and stick of threat which has proven through the years to be a reliable combo lasso to rope them in. I don't think the writers are just going to push reset; I don't think they even quite understand the concept. The Mom reveal and her astonishing contempt about "some girl" was unsurprising to me but Lucy's shock was completely in character. I hope if we get S2 we will find that S1 was the downward arc of a classical comedy, with the heroes constantly losing ground until what might be the beginning of a turnaround in this finale. Perhaps in S2 they begin to gain on their enemies, learning more and getting a better position instead of continuing to lose ground. With that ending they left 3/4 of the time travellers (all of them except Rufus) in the same place--having lost loved ones that they can't recover despite their best efforts. I like the way that emotional playing field has been leveled. While I'm not fond of the Rittenhouse reveal by Lucy's mother, I can understand why the production team wants to keep Susanna Thompson around (presuming there is a season two)--she's a strong sci-fi genre actress with a good presence. Especially since we have got to know her over the course of the season, whereas the viewers really don't have any attachments to Lucy's sister. I was disappointed by Flynn's capture, but wasn't really surprised by it given the status of show (wanting to wrap things up plus wanting to preserve future possibilities.). Overall, I was satisfied enough with the efforts and hope that there is a season two in the future. I assumed it was a flash to a present-day partially-destroyed Golden Gate Bridge, not a flash to the initial construction, though I can't think of any way they could have made that clear on-screen. I really hope they get renewed - that was exciting for a season finale, but kind of a bummer if it turns out to be the series finale. I live in the timeline where there's an S2. So in the original Amy timeline, I'm assuming Lucy's mom was sick because in that timeline she had turned her back on Rittenhouse, right? And all the other non-Amy timelines, she was healthy because she was with Rittenhouse and just stringing Lucy along until it was time for the reveal? And why would Jiya be the only one experiencing the MysteriousTimeFlickersTM? There were four of them in the boat. So relieved the writers didn't make Wyatt declare himself even more overtly than he did. I'm doubling down on there being an episode where he has to actively choose between Jess and Lucy, and the groaning you hear from the general direction of the Rockies will be coming from chez moi. And why would Jiya be the only one experiencing the MysteriousTimeFlickersTM? The TimeFieldTM varies all throughout the ship during its operation, and is carefully tuned so that stable null points center around the pilot and passenger seats. Away from those null points within the operating machine, the temporal effects, particularly for a living thing, can be ... unpredictable. Presumably part of the challenge of building the mothership was arranging for more null points to accommodate more riders. Since Jiya wasn't in one of the seats, she wasn't at a null point and experienced the chaos of the TimeFieldTM as the machine was navigated. I was thinking maybe she's pregnant and something about the whoosh of sending two generations at once, one eggshelled inside the other, creates some sort of a rift? I assumed it was a flash to a present-day partially-destroyed Golden Gate Bridge, not a flash to the initial construction, though I can't think of any way they could have made that clear on-screen. It was only when I rewound and paused did it notice that 1) it looked more like the construction photos and 2) there was an older-looking (e.g WWII-era) ship heading into the Pacific. I don't recall when the bridge was painted it's signature color; but perhaps, they could have left it unpainted and added a prop-style plane to emphasize the jump back? Glad to see I wasn't the only one who didn't realize it was a jump back in time. I know prognosticating isn't super useful, but what are the odds it gets renewed? It still hasn't been renewed but I read that it has crazy +7 numbers. The cancellation bear has tipped it from toss-up into likely renew, though admits it's a hint arbitrary. I sure hope there's more. I enjoyed the mom reveal and my only complaint about it is that they leaned hard on the "girl nobody cares about" thing to the point where they couldn't include a very reasonable and human point from mom. Lucy is talking about upending the only life mom knows for the sake of someone who is nothing more than a memory to Lucy. There's even a bit of symmetry with the fact that it seemed to be an illness that harmed her mental faculties as well; Lucy would harm mom's mind for the sake of someone who only exists in hers. But you can't have a heel turn AND expect us to have sympathy for risk to her. Maybe TNT or something will pick it up? Wow! I had extremely little hope that another network was going to pick it up, but I would never in a million years have expected NBC to change its mind. Now hopefully the show-runners will take this near-cancellation to heart and make sure to craft a solid arc with a satisfying ending for this 10-episode reprieve. 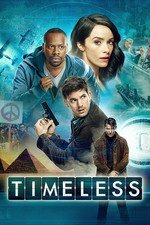 Timeless is probably a very expensive production with its period sets so different from episode to episode. It also took its time developing any real tension between the principal characters. But when it worked, it worked very well, and its in-story theory of time travel was very different from most other offerings, with the present being a little different, and sometimes not in a trivial way, from the way it was before the time trip. Should be coming next year! Update on Season 2 premiere!